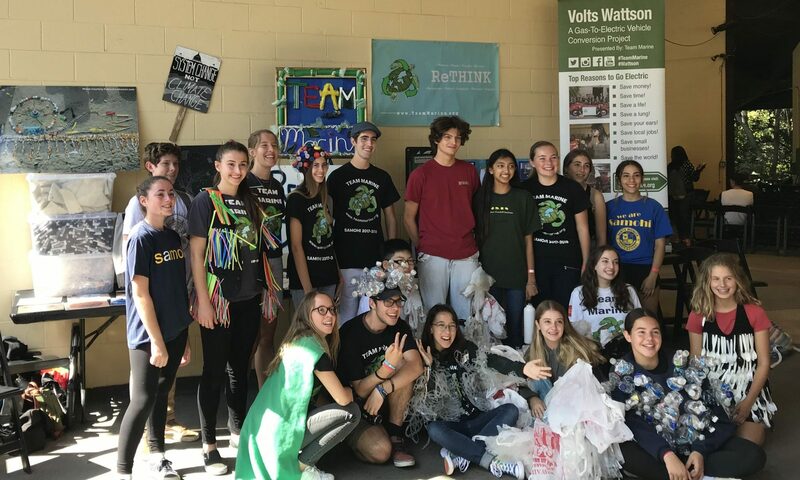 We attended many conferences, workshops, and lectures to teach ourselves about sustainable living and the effects of plastic on marine life. We attended beach cleanups, conducted a plastic bag drive at our school, displayed a REthink Art Piece on the beach near the bike path using the collected 111 lbs of plastic bags, testified at City Hall to persuade city council members to ban single-use plastic bags from retail stores in SM, organized two student marches to promote reusable bags over plastic bags, hosted and presented in a Generation Earth Water Pollution Workshop, created the Team Marine environmental website, made a humorous environmental educational video that we posted on Youtube, and organized and presented in Focus the Nation Day at Santa Monica High School to raise awareness about global climate change and plastic pollution in the ocean, performed an eco-check survey at 8 local grocery stores to see which one carried the most bio-friendly products, and conducted a survey of plastic pollutants before and after a storm. We won 1st Place in the QS challenge and won an all expenses paid trip to Cozumel, Mexico. Sup Ya’ll, and thank you for visiting the Team Marine website! I am the coach and Marine Biology Teacher of the Team Marine students at Santa Monica High School. My passion for the marine environment and protecting this precious resource stems from my youth. I grew up in LA surfing, fishing, and diving in our local waters. As a senior at Palisades Charter High School, I took Marine Biology with Mr. Ray Millette who inspired me to pursue Marine Biology at UCSB and become a teacher. In college, I studied abroad in Brisbane, Australia at the University of Queensland, where I got to dive the amazing Great Barrier Reef. I enjoyed the program and the people there so much, that I later returned to the Down Under to do my Master’s Degree in Marine Biology and play soccer for the university. I lived in Australia for four years all together, conducting my own research on remote tropical islands, snorkeling and diving amongst some the most magnificent corals, fishes, turtles, and sharks in the world. It was a privilege to be in such a beautiful place, but it was also a lot of hard work. I wrote a 270 page thesis on the feeding behaviors and predatory impact of gobies, a very diverse group of small-bodied fishes. I will soon be publishing several research articles in international marine biology journals. After completing my master’s, I jumped into teaching and completed my Teaching Credential at Cal State University, Northridge. My name is Craig Carcary, and I am a senior at Santa Monica High School. I have participated in many sports throughout my childhood, but have excelled in water sports in particular. I participated in Little League baseball up until I started high school, and sailed every summer between the ages of seven and 13. To this day, I continue to sail on the weekends with my uncle and every year in the nationals with him and our team. At 14, I moved onto Junior Lifeguards with the Los Angeles County Lifeguards. This training helped me make both the high school water polo and swim teams, both of which I’ve stuck with through my senior year. I absolutely love water sports. Besides the above, I also enjoy surfing, bogie boarding, snorkeling, diving, boating, and anything else including the ocean. I use the ocean recreationally, and am so glad to be in a position with Team Marine to give back to it. Hi there my name is Daniel Farahdel and I was born on November 15th 1991 in one of the greenest cities on Planet Earth, yes, Santa Monica, California. I’ve always been a determined and hardworking student. I play almost every sport, from basketball and tennis to shot put and discus. Ever since 9th grade I’ve played track and field, playing Varsity my sophomore year and receiving “The Coach’s Best Player” award for my great achievements. But I’ve been asked numerous times, “Why did you sign up for Team Marine? !” Well, there are many answers to that question. First off, working with Team Marine is a great challenge for me and it prepares me for the days to come in life. I’ve learned to manage my school work, sports, and Team Marine. For me to actually have the power to make a difference in this world makes me just want to jump off my seat. Us youth are the future, and I hope one day I can inspire every single child and adult out there to go green. I’m not doing this just for my good, I’m doing this to save lives, including the lives of all the sea mammals in our ocean. Before Team Marine, I had invested little thought toward the environment, but now I’m more conscience than ever. The Team Marine experience has helped me figure out so many things, for instance, I’ve decided that I’m going to pursue Environmental Business as a career and help others go green. This way, I will be to enjoy what I do and feel the personal gratification of helping others. Hey my name is Daniel Hakhamzadeh, but people call me “Hawk.” Being the first generation to be born in the USA has altered my life in many ways. My parents came from Iran, knowing very little about America. My role was to advise them about the many ways to be sustainable. From recycling to conserving electricity, I have assisted my family in many ways to help stop global warming. In school my favorite subject is science, because to me, it is very useful in life. The science course I am currently taking now is marine biology. This class has heightened my awareness of many natural phenomena, such as such as the different types of tidal patterns in the ocean. As a freshman and sophomore, I participated in track and cross country, struggling in almost all of my races and practices due to my flat feet. The only thing that kept me running was the beautiful view of the ocean as I ran along the bike path and up the California PCH incline. From the hot days when the sun beat down on my head to the rainy days when I’d would get completely soaked, the beautiful scenes of the ocean relieved the stresses of school and work. Even though I haven’t been able to keep up with my cross-country team this year, I made a resolution to stay in contact with the ocean and give back to it-just like it has helped me out during my running days at SAMOHI. Team marine was my golden opportunity to achieve this goal and help protect the Santa Monica Bay. Hey Guys! My name is Caroline(a) Knab, and I am currently a Junior attending Santa Monica High School. Without a doubt, my favorite place in the world is the ocean, or any place which is tropical, wet, and sandy! I would literally do anything to be able to save our oceans, and all the beautiful, amazing marine life that is rapidly dying because of us humans. I lived in Germany for the first seven years of my life, and I think that the experience of moving from one continent to another really opened my eyes. It has made me appreciate and adore living in a beach city so much more than I could have ever imagined. I love sports, especially body surfing, swimming, track, tennis, and last but not least, soccer. Before I die, my only wish is to be able to travel around the world at least once, visit all the third world countries, see all the different types of marine habitats and reefs, and of course learn about all of the different cultures. If I could, I would live forever, so that I could meet as many people as possible and share my passions with everyone. I’d love to watch the world change in front of my own two eyes. As for my outlook on life, I believe that if you want to accomplish something, you can do it, and if you start to doubt yourself, think again, and put your heart and soul into it. Experiences, like being on Team Marine, and other sports teams, have reassured me of this statement. We have accomplished so much, and are only going to go bigger from here! I would like to throw a little shout out to Mr. Kay, and the rest of team for making this environmental journey so amazing. What a huge project, and what a tremendously fun and adventurous time we continue to have. Thank You! Hey green lovers, this is Yassi, legally known as Yassaman Sarvian. I’m a Santa Monica native and a junior at Santa Monica High School. When I’m not with Team Marine, I’m also in SAMOHI’s band program as a flute player, in SAMO’s student government as one of the student body’s representatives, and one of the Junior Class Representatives for the Dealians Honor Society. I’m also a Friend Liaison and one the four Historians for Circle of Friends, a school program that promotes the inclusion of special needs students with those without special needs. I’m also Vice-president of the Baha’i Club as well as the On The Move For the Globe Club at Samohi. When I’m not running around from place to place trying to handle these activities and my two college course classes at Santa Monica College, I’m either dancing (ballet), acting, shopping, or hanging out with friends. Currently I don’t know what I want to do for my future job, but I am seriously considering an environmental career. After living in Santa Monica all my life, I am able to appreciate the beauty and greenness of the city. Out of the whole Los Angeles County, Santa Monica is the greenest, which makes me really proud to be on Team Marine. Being on Team Marine has helped me work on my time management skills, something I know I will have to master by the time I reach college. But that’s not the only reason; when I first heard about Team Marine, I immediately thought, “Wow, this is something I really want to be a part of.” After my epiphany, I strived really hard to make Team Marine and was selected! 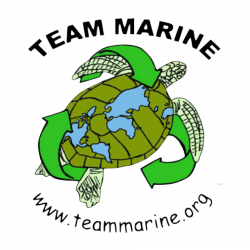 Team Marine has voiced my feelings and concerns for the environment more than ever, and I feel that at this point, we as humans can reverse environmental degredation. To you internet surfers, enjoy our site and remember: We have the key to saving the planet. It’s time we do something about it…Commit to the Little Things Commitment! Hey everyone! My name is Evelina Weary, and I am a junior at Santa Monica High School. After home hopping from Boston to Philadelphia, my family decided, “Hey, why not move again and live in Southern California?” So, we ended up here and it has been the best decision ever, since we get to hang out at the beach and admire the beautiful ocean in stable 70 degree weather. The beach remains one of my favorite pastimes. As for science, I’ve always been in the loop! I grew up being amazed by the craziness of Bill Nye the Science Guy and attending school science clubs. I also had the privilege of babysitting the children of Heal the Bay’s, Mark Gold (Ex. Director) and Lisette Baurasach. When I am not annoying Team Marine with my never-ending supply of ideas, I am hanging out with my amazing friends and boyfriend, dancing, running cross-country/track, annoying my four younger siblings, listening to music, eating, and being Treasurer in SAMOHI’s student government. I also run around in circles trying to avoid the college craziness. I hope to be an advertiser someday and live in a world where people care about each other and the environment around them. Enjoy your time on this website and remember: you CAN make a difference.